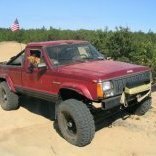 I didn't realize how many parts I can use off my ZJ jeeps to upgrade my XJ or my MJ. This list is great thanks Pete. I'm already making plans to take parts off my ZJ,and a list now of what I can use to upgrade with.